WASHINGTON (CNS) — What a long, strange trip it’s been. Not walking the 500 miles in a pilgrimage from southern France to Santiago de Compostela, Spain, that Lydia B. Smith first did a decade ago. Not even making a documentary about “the Camino,” as the pilgrimage is called, when she returned a year later with a camera and film crew. It was getting the documentary aired on PBS stations. At long — very long — last, Smith’s hopes are being realized. “Walking the Camino: Six Ways to Santiago” is being shown in December on more than 200 PBS affiliates in 118 cities throughout the United States. 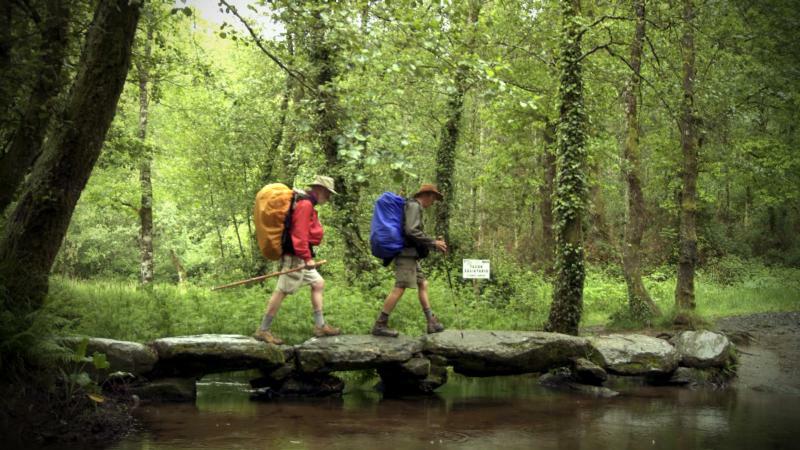 Thanks to repeat showings, “Walking the Camino” will air more than 1,000 times before the year is out. The biggest cities where “Walking the Camino” will be shown on the primary PBS channel are St. Louis and Kansas City, Missouri; Cincinnati and Dayton, Ohio; Albuquerque, New Mexico; Louisville and Lexington, Kentucky; and Boise, Idaho. But it’s not like the documentary has been on the shelf all this time, Smith told Catholic News Service in a Dec. 10 telephone interview from Portland, Oregon. Smith said she took it to film festivals, where the positive reviews encouraged her to pitch it to movie houses in Portland and nearby Ashland, Oregon. When “Walking the Camino” did brisk business, including some sold-out houses, during multi-week runs in both cities, she did a bus tour of the movie, renting screens as part of a cross-country caravan in 2014. The effort made the movie the 12th-highest-grossing documentary that year. Smith offered it to the public broadcaster, only to blanch when PBS asked for a $55,000 airing fee. Attempts to get it on the lineup for PBS’ “Independent Lens” and “P.O.V.” documentary series were also rebuffed, as was a pitch to PBS to air it as a pledge-month special. Smith said she’s walked the Camino six more times since making the documentary — nearly annually, she said, except when taking time to promote the film. She said she’s been on a “Camino of gratitude” because of the positive reception of “Making the Camino.” It’s been in theaters and/or TV in seven other countries. “The United States will be the eighth,” Smith said. She added she has noticed an upsurge in American travelers to Santiago since Smith made her first Camino in 2008. She ascribed much of that to the 2011 Emilio Estevez movie “The Way,” which starred his father, Martin Sheen, as a father burning off his anger and grief by making the pilgrimage in memory of his son (Estevez), who died on the Camino after barely starting it. But “my film has definitely been an influence,” Smith asserted. Editor’s Note: For a state-by-state listing of “Walking the Camino” air dates and times, go to http://caminodocumentary.org/current-airings.